A few months ago, a fellow Canadian who had just moved to Stockholm contacted me and offered to go for coffee. Although we did not know each other, we had a common professional past, so that was not totally weird! We quickly became friends and now meet regularly for coffee or drinks. My new friend is also passionate about photography. In the last few months, I also started enjoying photography more and more, but mostly through the lens of Andy, Marina and Martin (I strongly recommend that you click on their names to see what I am talking about). After posting a few photos on this blog or on FB, my new friend commented that it was time for me to get a new camera. She was right. When I started looking at photo stores in Stockholm, I realized that there was one on Kungsholmen, right between where I live in Södermalm and where my friend VC recently moved in Vasastan. Since I had to go out of Södermalm anyway today, I decided that it would be a good opportunity to explore a non-Södermalm café. I had asked VC to accompany me to the photo store so that I would have someone there who could ask the right questions! 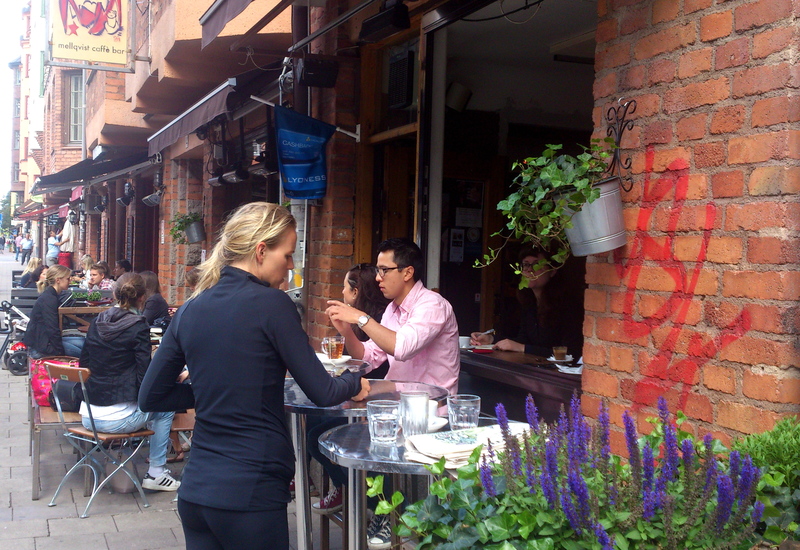 She kindly accepted and offered to go for coffee first at Mellqvist. Now, I had been to Mellqvist on Hornsgatan, so I was a bit curious about that one. It was a bit too crowded this morning to start asking questions, but judging by the quality of the egg sandwich I had for breakfast, I am pretty sure that the two Mellqvist are somehow linked. Although I am always a bit biased towards Södermalm, I have always loved Sankt Eriksplan. In fact, I had passed by Mellqvist on Rörstrandsgatan many times, including on my way to Balzac (which is apparently now – and sadly – closed). 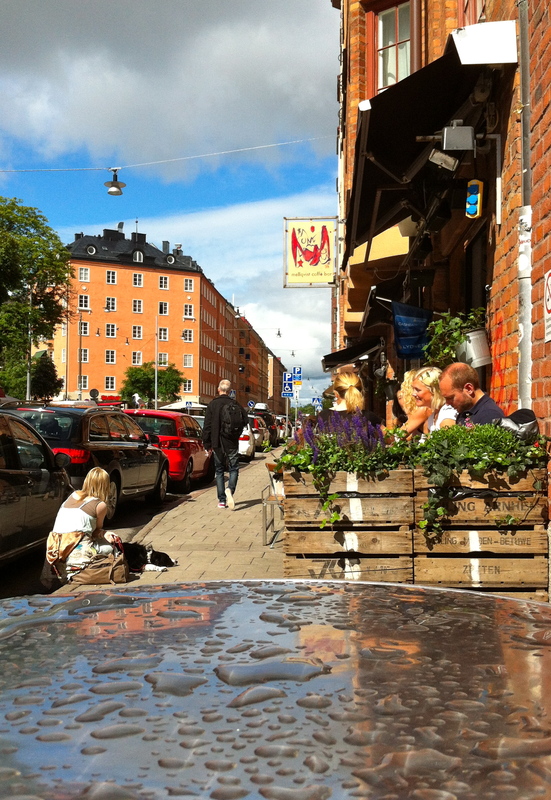 While there are many cafés on Rörstrandsgatan, Mellqvist is always full. After the rain we had overnight, the sun was shining this morning and folks from Vasastan looked quite happy to chill on the sidewalk, enjoying a Mellqvist breakfast. As expected, breakfast was delicious this morning. 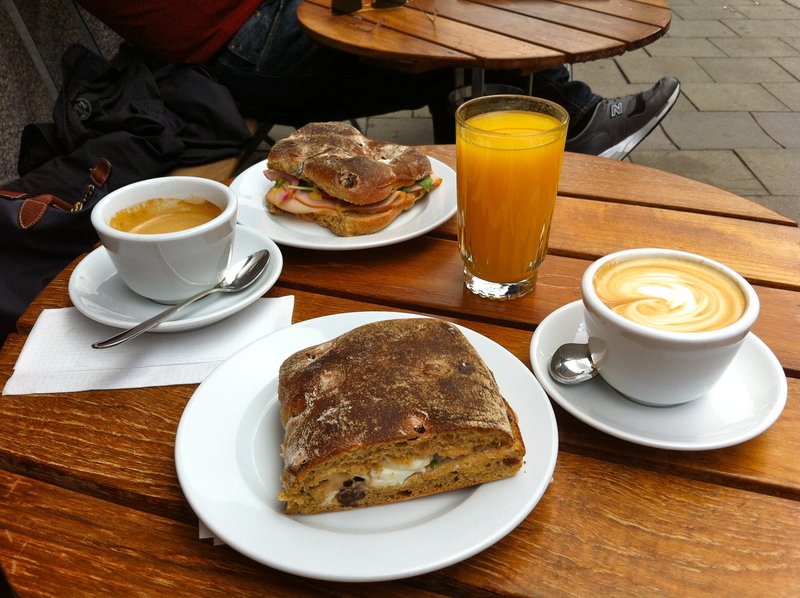 The egg sandwich was just as good as the one at Mellqvist in Södermalm! Obviously, Mellqvist must be great for fika was well, with a nice choice of “bullar”! After a nice breakfast in good company, we crossed the bridge on Sankt Eriksgatan into Kungsholmen to go the photography store. I know myself. I was pretty sure I would leave the place with a new camera. I just didn’t know which one. After looking at a few models, and listening carefully to VC’s advices, I finally left the store with a new toy! You will probably continue to see a lot of iPhone photos here, although I look forward to get out and play with my new toy! 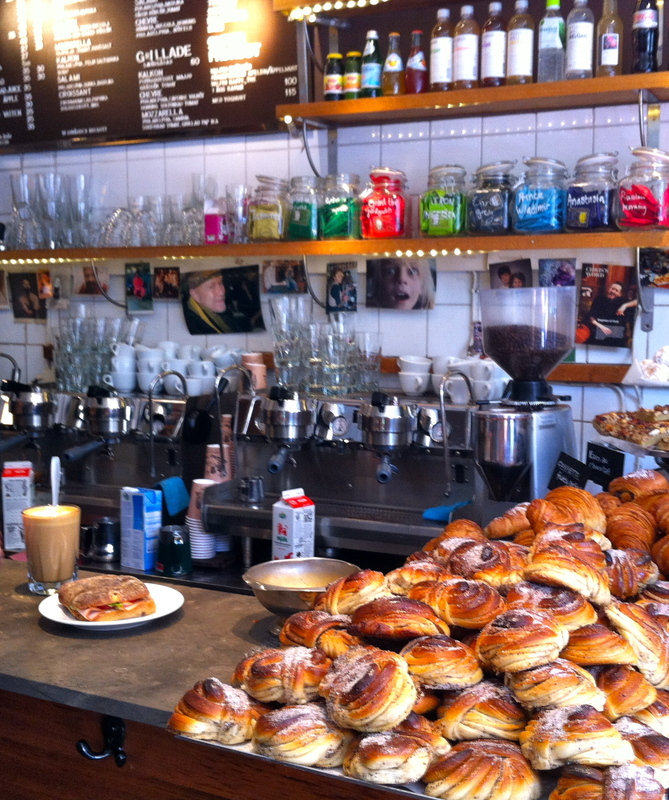 Mellqvist café & bar: yet another reason to love Sankt Eriksplan! 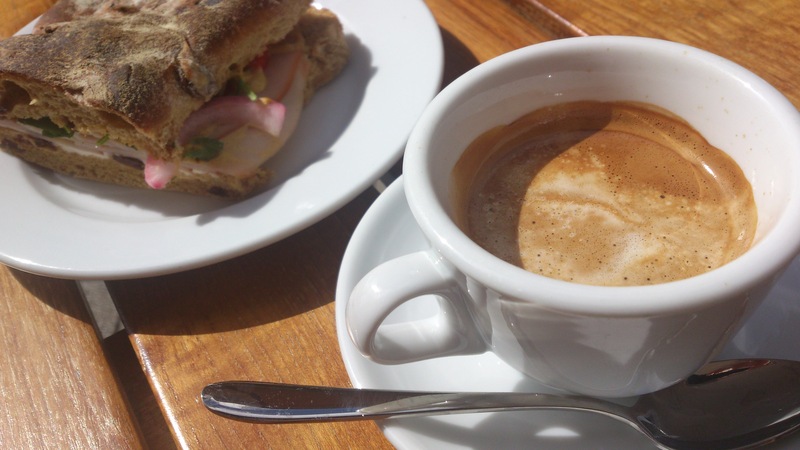 This entry was posted in Breakfast, Coffee, Photo. Bookmark the permalink. There is no time like a sunny Thursday morning to go to Mellqvist… The terrace was full of mothers with strollers and very hot gay men, but inside the café the atmosphere was quite relaxed this morning and, as I ordered my egg sandwich and double macchiato, I took the opportunity to have a chat with the staff. Are you ready to hear it? The two Mellqvist’s are indeed related: the one in Södermalm is the little brother of the one in Vasastan, which has existed under different names but same family ownership for over 50 years. congrats on your new camera, and you’re so kind to mention me in your post! Thank you! Tell me, what made you get the Canon over Nikon? Thank you Marina. To be honest, the Nikon and the Canon looked pretty much the same to me at this stage. However, I understand that it might be a bit easier (or cheaper!) to add equipment to the Canon … should I ever reach that level. So exciting!! Looking forward to some more scrumptious photos. That Fika looked amazing. Kinda like danish meets cinna-bun? Yes mademoiselle! And the crazy thing is that even I can take nice photos with that kind of camera. Now, the challenging – and fun – part is to move away from the automatic mode. Yay, congratulations for the new camera!! 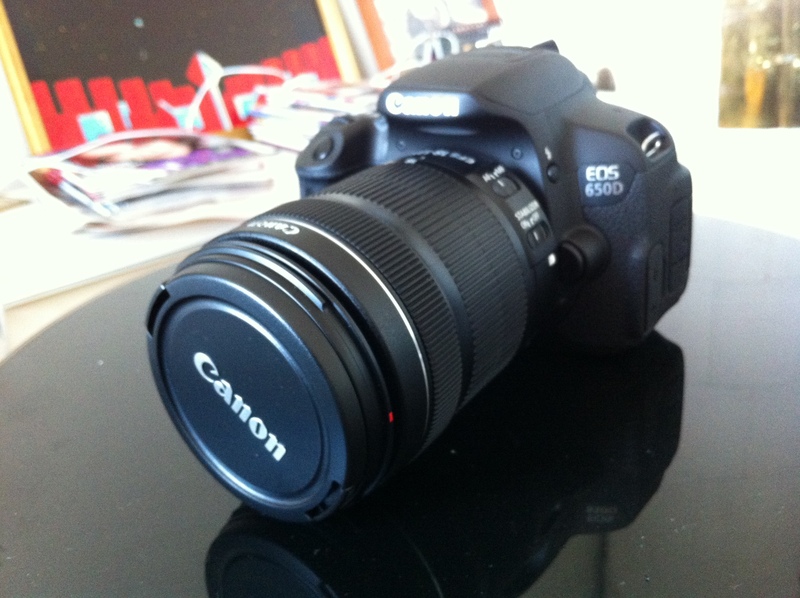 I bought an EOS 550D but still don’t know how to use it! I will take a few weeks to play with the camera and then take a course so hopefully I’ll know how to use it at some point!